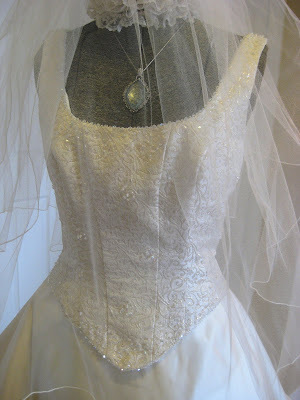 Here are the photos of a stunning gown I acquired recently for my online Bridal Boutique ~ to be listed shortly. It is made by UK Bridal Designer Ian Stuart. Ian's award winning designs are highly sought after by bride's all around the world. These first two pictures were taken in the evening ~ which brings out rich gold tones. 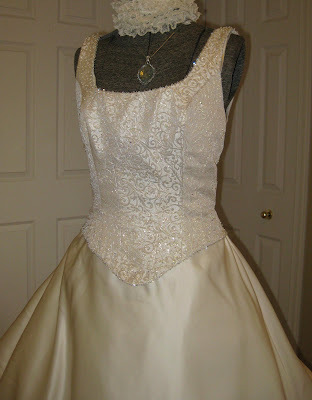 The wedding dress is a lovely shade of ivory in the daylight. Ian Stuart began his training at Bellville Sassoon, one of London's finest couture houses and is know for creating gowns for socialites and members of the Royal Family. With more than a decade of knowledge and experience in London and New York behind him, Ian launched his own bridal wear brand in 2003. 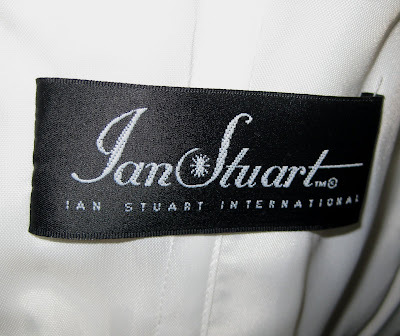 Based in London, the collection designed by Ian Stuart Ltd was an instant success. It is said that "Launching his own brand has allowed Ian to concentrate on creating collections which truly reflect his passion for innovative bridal design, without any restraints or compromise." As quoted by One Wedding: "Ian provides brides-to-be with a luxurious and diverse selection of shapes, colours and fabrics to reflect their own individual style." As shown on the original tag, this gown sold for a considerable amount. I am selling this gown for less than half of the tag price. 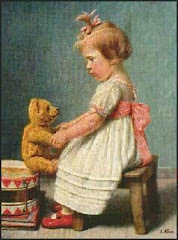 I have many more photos if you wish to see them. The gown is a North American size 10. It has a 36 inch bust and a 29 inch waist (a bit large for my size 8 mannequin). 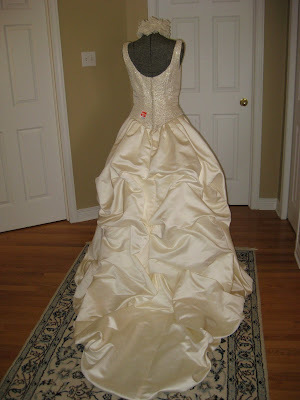 The dress has a 3 foot train and a 46 inch skirt (waist to front hemline). Hi Karen, what an exciting venture you are on now. I love the beautiful dress....I would be thrilled to wear it, the previous post just gorgeous. Now the problem is I am married and well I think I flew past a 29 inch waist about 12. lol. take care. have a great Easter. It is nice to be able to visit you again. take care. Hi Karen...Oh my...how beautiful! So pretty.The bead work is exquisite and the back is so lovely. I've had company for the past week, so did not get time to post. The wedding gowns are gorgeous; I especially liked the beaded one. The details on these gowns are alway so gorgeous. Have a great Easter!